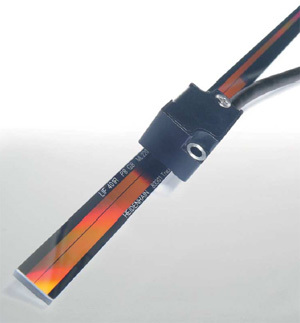 Exposed linear encoders consist of a scale or scale tape and a scanning head that operate without mechanical contact. 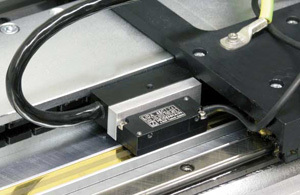 The scale of an exposed linear encoder is fastened directly to a mounting surface. The flatness of the mounting surface is therefore a prerequisite for high accuracy of the encoder. With the absolute measuring method, the position value is available from the encoder immediately upon switch-on and can be called at any time by the subsequent electronics. With the incremental measuring method, the graduation consists of a periodic grating structure. The position information is obtained by counting the individual increments (measuring steps) from some point of origin. Since an absolute reference is required to ascertain positions, the measuring standard is provided with an additional track that bears a reference mark.